The most complex and important parts of our city are below our feet. If things go right, we never even notice the thick layer cake of cables, pipes, insulation, and refuse that are packed right under the pavement. But in London yesterday and today, the city got a smokey reminder. As Gizmodo UK reports, a massive electrical fire—possibly fed by a gas leak—erupted in London yesterday afternoon. 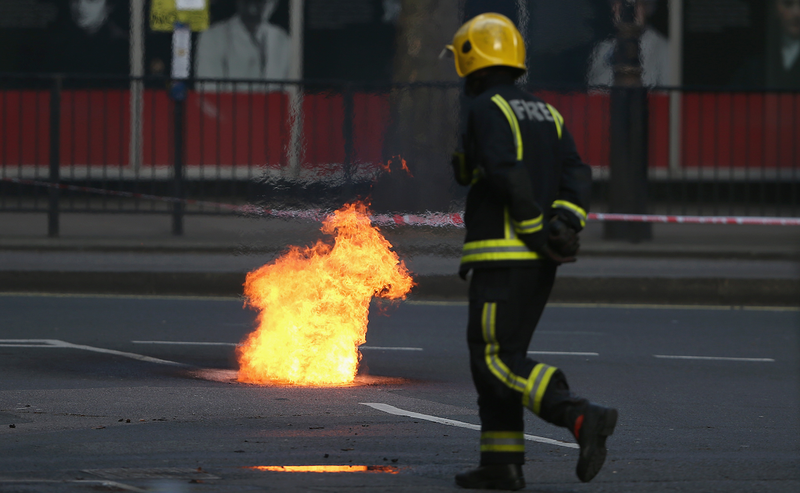 Because of the nature of the fire, firefighters were forced to let burn for 24 hours, according to the BBC, and thousands of London residents were evacuated while emergency crews sprayed down buildings nearby the manhole covers that were spitting flames into the street. Why? Because it was safer than trying to stop the fire itself, which may have led to an explosion. Thankfully, no one was hurt in the fire, and the city now says the blaze is under control. But it’s a reminder that aging infrastructure is becoming a bigger problem than ever in our cities. About a month ago, Reuters published a report on the growing problems here in New York, where in a single week in February ConEd reported 600 fires in manholes. Reuters says there’s an average of six manhole incidents a day in NYC. Flames rise from a manhole on March 8, 2015, in New York. AP Photo/Mark Lennihan. There are plenty of reasons why fires in the electrical systems just below street level are growing more and more common. The weather doesn’t help: Street salt, rats, and construction mistakes can penetrate insulation and spark fires. A single cable can carry many thousands of volts—the corroded cables create small fires and smoke, which build up until the manholes explode with incredible and dangerous force. It’s just another example of how urban infrastructure, some of it installed in the early years of the 20th century, is literally fraying at the ends. But it’s one of the most pressing, and one of the most difficult to imagine solving, since replacing every cable housing on every city street is impossible. So, does this mean that NYC, London, and other aging cities need to replace thousands of miles of cabling under their busy streets? In some places, yes. But Reuters points out that researchers are working on alternatives, too. A few years ago, a team at MIT and Columbia set out to use machine learning to figure out where and when these manhole fires would occur in NYC. They used data mining to pull information about the age and vulnerability of ConEd’s cabling and manholes (of which there are 51,000!) recorded on “tickets” by the company. The scientists were able to parse these data into an algorithm that could predict where the next explosions or fires were likely to occur. Their project gives us a glimpse at the realistic middle ground between ignoring our infrastructure woes until our cities collapse and the doomsday scenario where we’ll need to replace every inch of street over the next few decades. For now, the fire in London will keep smoldering—but in the future, city engineers might know where and when to look out for the next problem.